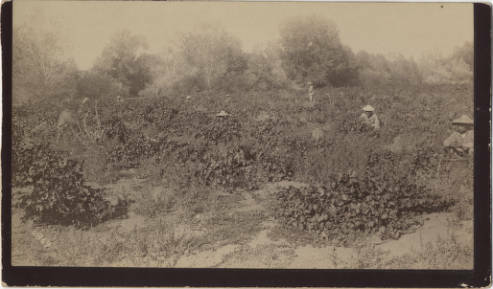 Chinese Workers on John Bidwell’s Ranch. Special Collection, Meriam Library, CSUChico. John Bidwell always had a need for workers — lots of workers, both skilled and unskilled. He had a diverse workforce — whites predominated, but he also had Indians, Mexicans and the occasional African-American. Bidwell was willing to employ anyone who would do the job, but he was always trying to control expenses. He employed Chinese workers because they were generally hard-working, reliable, and cheaper to pay. All the time I was on the ranch we only had one strike. We let a contract for gathering and hulling the almond crop, at 3 cents per pound, dry weight. They (the Chinese workforce) had only worked half a day and had hardly got started [when they went on strike]. They were glad to take the job and they did good work and we got the work done at just a little more than we were going to pay the Chinamen.